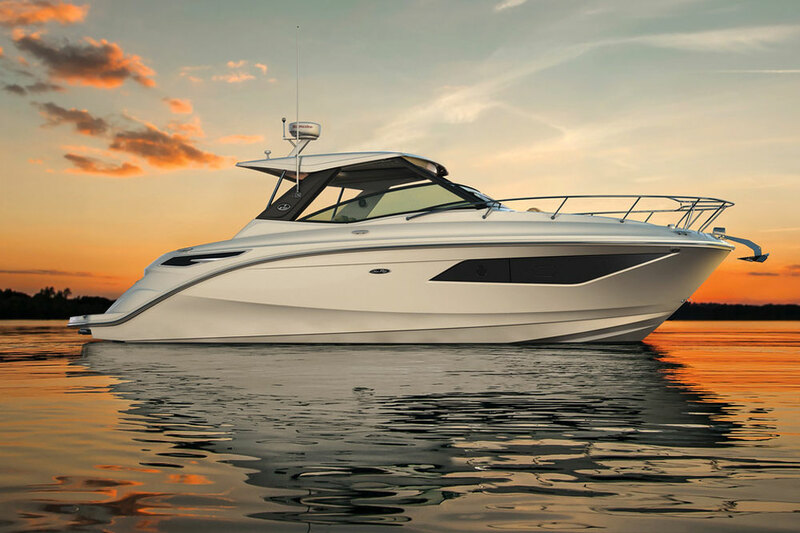 The 2017 Sea Ray Sundancer 350 Coupe gives you new ways to change the boating experience. 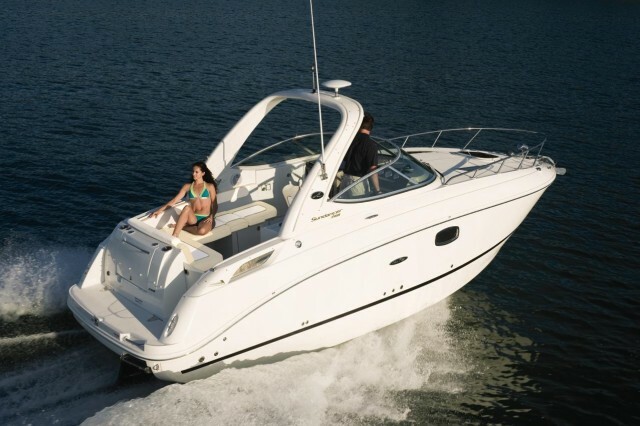 There’s a huge change in the Sea Ray Sundancer line when you get to the Sundancer 40 and larger models. These boats have fully enclosed helm-decks. Smaller Sundancers in the line have a hard-top supported by an arch, which leaves the helm-deck open to sunshine and sea breezes. Each design has its merits; in the case of the larger boats you can cruise comfortably in all weather with complete climate control, and on the smaller boats you get a full dose of the great outdoors. 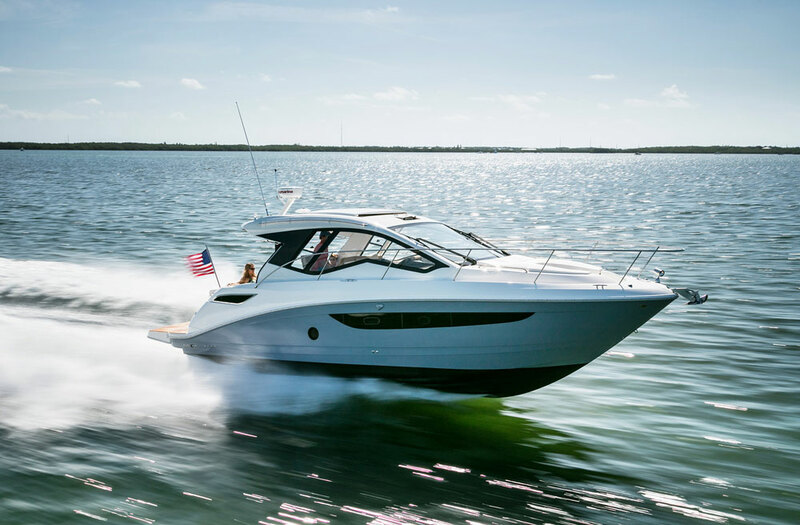 The Sea Ray Sundancer 350 Coupe, however, bridges the gap between these two designs, providing you with a healthy helping of both the natural environment and the ability to “change” the climate. Climb aboard with us for a moment, and you’ll quickly see what we mean. That full windshield is the key feature. You can still roll back the sunroof and get some serious airflow through the bridge, but when you close it and crank up 16,000 BTUs of air conditioning, even with the absence of an aft bulkhead the area is contained enough to chill down. And if you plan to cruise in iffy weather or when you want even more control over the climate, you can simply add the optional aft curtain to seal off the bridge-deck from the elements. Thanks to the single-piece construction of the windshield there are no center mullions in the way of your view, so as a bonus, visibility is actually better than it would be with the hard-top and canvass arrangement used to shelter the helm on smaller Sundancers. Even in the cockpit, Sea Ray gives you ways to at least partially control the climate. An optional retractable sun shade slides out the back of the cockpit overhang at the press of a button. Your comfort also gets enhanced with oodles of seating, including a huge port-side lounger with a drop-down table that converts the entire area into a sunpad. 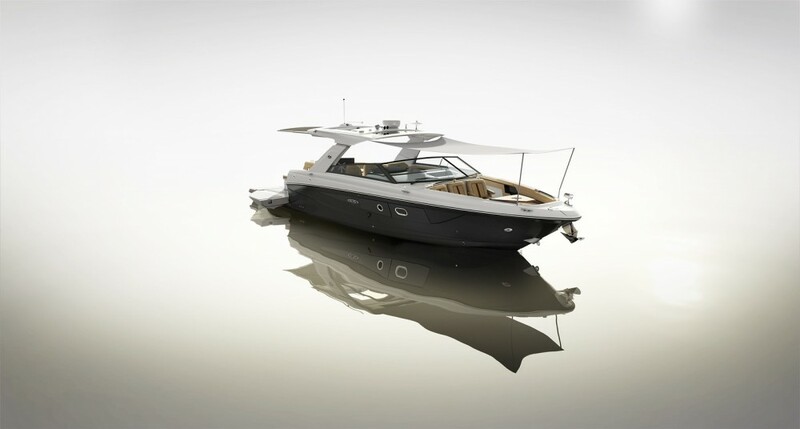 Plus there’s easy access to a carry-on cooler, there’s snap-in carpet underfoot, indirect lighting all around, and an extended swim platform on the transom. Opt for the transom gourmet center—how could you not?—and you can grill al fresco while listening to tunes on the stereo system. The bow has been made more comfortable, too, with a new bow lounger that includes an articulating backrest. It’s a good use of space, but the cabin’s overhead hatch is located right at the center of the lounge’s small cockpit, where it’s hard to avoid standing on it. Sea Ray takes advantage of every inch of the boat, from the transom to the bowdeck, to maximize useable space both indoors and outdoors. Down below, you might be separated from sunshine and salt spray but your comfort level will most certainly not take a hit. There’s a twin berth mid-cabin behind the entry stairs, a galley to starboard, and settees to either side forward. The bow houses the master, with a memory-foam double berth all the way forward. 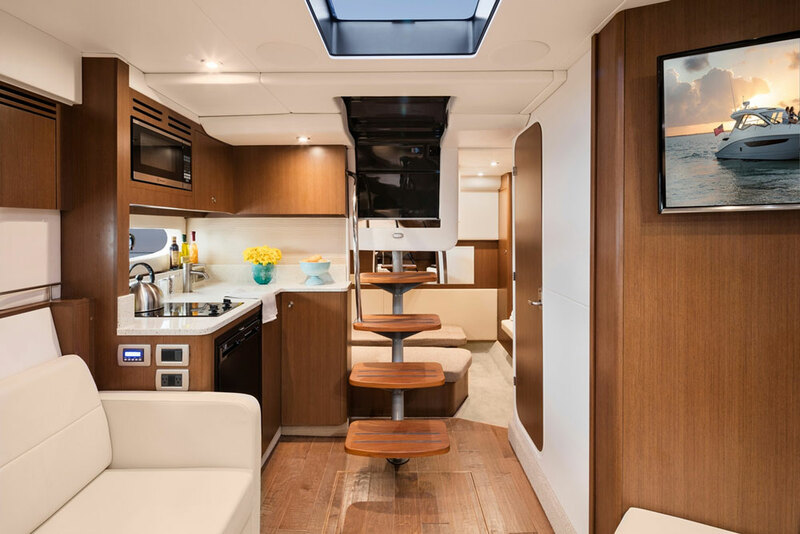 The standard interior on the Sundancer 35 Coupe is finished in chestnut, but cherry and pecan are both options. 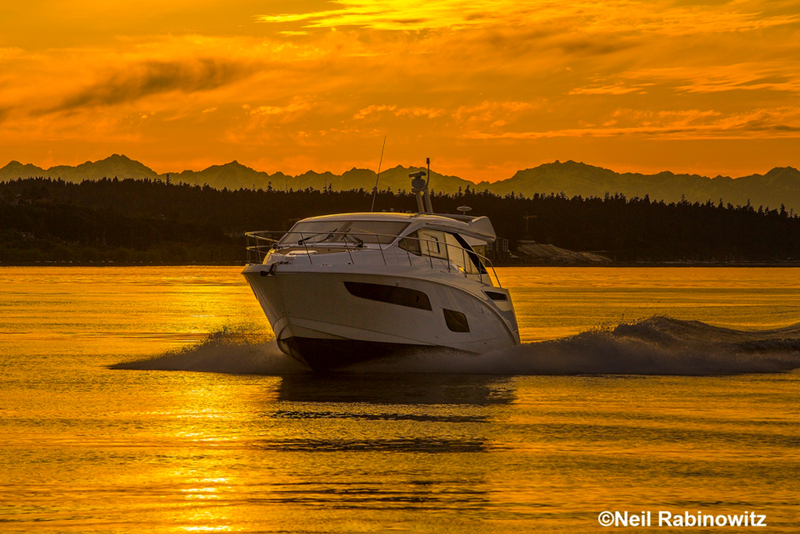 To earn the Sundancer name, of course, the 35 Coupe has to perform like a Sundancer. 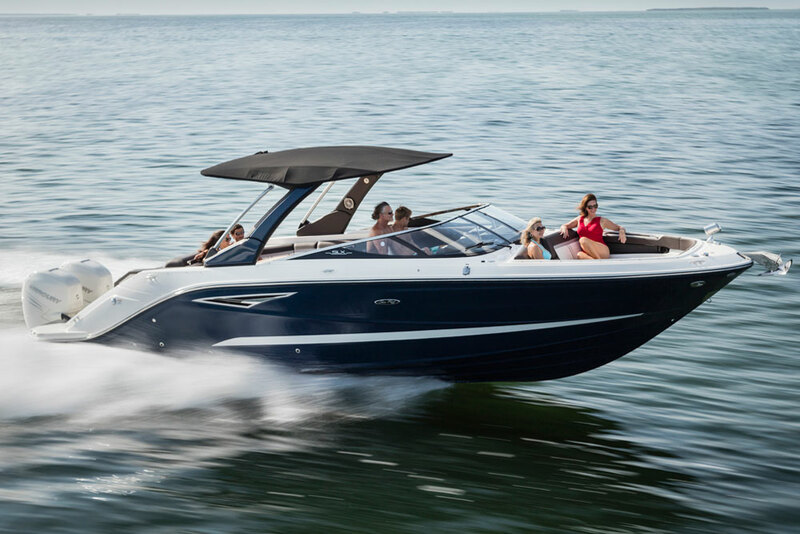 Standard power is a pair of 350 HP 6.2L MerCruiser stern drives, and there are multiple options ranging from 8.2L MerCruisers to 4.2L diesels and/or V-drive inboards. We couldn’t take the 350 off the docks when we saw it at the Fort Lauderdale Boat Show, because it was penned in by dozens of other boats. Fortunately, however, we do have plenty of experience with past Sundancers in this size and weight range with the same or similar powerplants. Depending on which engines you choose, how many options you load the boat down with, and the load onboard, plan on cruising speeds ranging from the mid 20’s up to the 30 MPH range, and a top-end from the mid 30’s up to the 40 MPH range. SmartCraft diagnostics plus digital throttle and shift are standard, and Axius with joystick control and VesselView display is optional. If you’d prefer a bow thruster to Axius that’s an option, too—in case you hadn’t noticed yet, Sea Ray provides a ton of different ways to option-out the boat and more or less semi-customize it. Just which of those options you choose will have a dramatic impact on the boat’s price. The base MSRP starts at $415,414 but big-ticket items (like maximum power with Axius, navigational electronics, a generator, cockpit air conditioning, etc.) will creep the price tag up toward the half-mil mark. But hey, it’s just money. And how much would you pay to be able to change the weather? 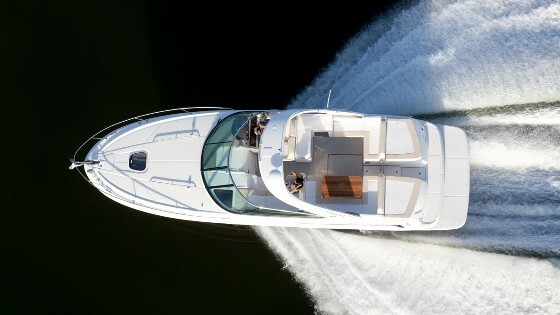 With the Sea Ray Sundancer 35 Coupe that kind of control is exactly what you get—along with a whole lot more. 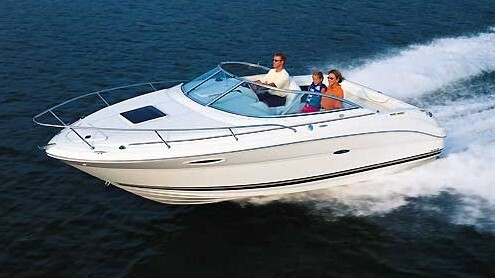 Other Choices: The Regal 35 Sport Coupe will be of interest to shoppers looking at this type of boat. Another good option would be the Monterey 360SC. 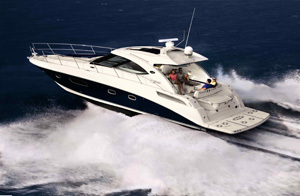 For more information, visit Sea Ray.